Parking for other stadium events can be found here. *Please be advised that designated parking lots and locations may be subject to change per event. Please check the event page if alternative parking has been designated. To view our general parking map click the link below. Event-specific information can be found in the Event Guides for each event on our "Plan Your Visit" page. During some Camping World Stadium events, such as our signature annual events, complimentary shuttle service to the Downtown Orlando area is provided. Additional parking is available in the downtown parking garages, with a fee to park. Specific shuttle information can be found in the Event Guides specified for each event under "Plan Your Visit." 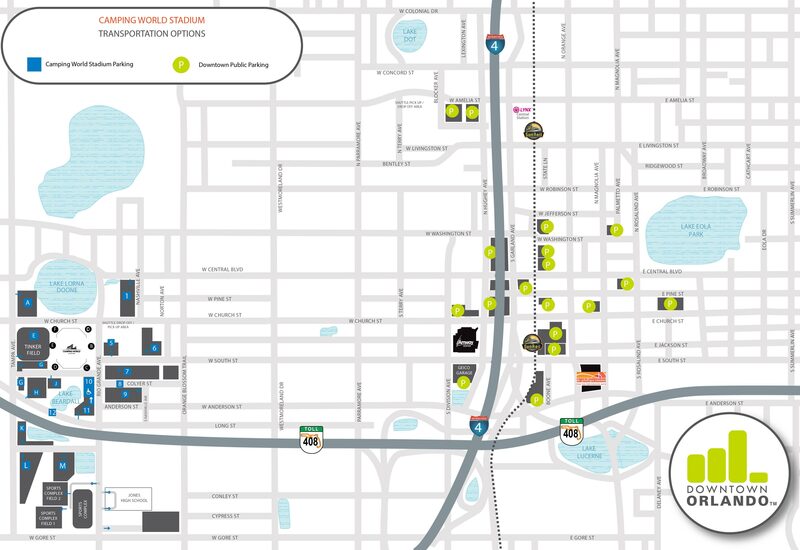 When traveling Downtown, please allow extra time due to construction on I-4 and consider using alternative modes of transportation including SunRail, Carshare, Bike Share, LYNX, LYMMO, carpooling and adjusting schedules when possible to avoid traffic delays. I-4 Ultimate is an important project for Central Florida. The 21-mile makeover — from west of Kirkman Road in Orange County to east of State Road 434 in Seminole County — will transform the region while connecting our communities, improving our economy and enhancing livability for everyone. Click here for additional I-4 updates. The Florida Department of Transportation encourages travelers heading to the Camping World Stadium to use the 511 Traveler Information System to stay up-to-date on delays, road closures, construction and more. The 511 system provides information on all of Florida’s interstates, toll roads and other major metropolitan roadways. Drivers can get traffic updates by calling 511, visiting FL511.com or using the free Florida 511 mobile app available for iTunes and Google Play. Regional and roadway updates also are available on Twitter by following @FL511_Central. Located west of Downtown Orlando and just north of SR 408, the Camping World Stadium is easily accessible from multiple directions. Eastbound traffic should exit at Orange Blossom Trail, proceed north (right) on Orange Blossom Trail to the stadium. Event signs will lead you to the stadium. Westbound traffic should exit at Colonial Drive/SR 50 and proceed west (right) on Colonial Drive to Orange Blossom Trail. Proceed south (left) on Orange Blossom Trail. Event signs will lead you to the stadium. Eastbound traffic should exit SR 408 at Tampa Avenue. Event signs will lead you to the stadium. Westbound traffic should exit SR 408 at Rosalind Avenue and proceed west (left) on South Street. Event signs will lead you to the stadium. North airport exit to SR 436 (Semoran Blvd) and proceed north to SR 408 (E/W Expressway toll road) westbound. Exit SR 408 at Rosalind Avenue and proceed west (left) on South Street. Event signs will lead you to the stadium. 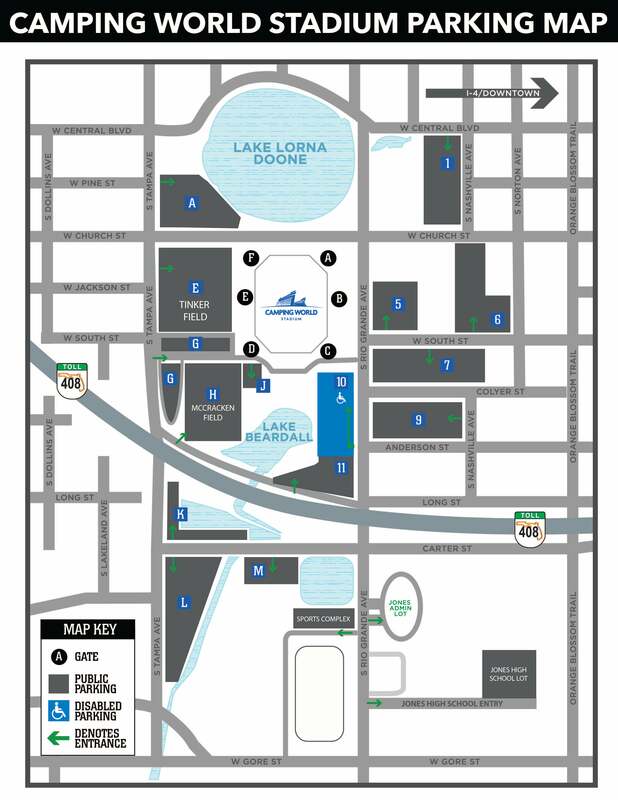 Below you'll find specific directions to the parking lots surrounding Camping World Stadium. Please note, not all lots are open for every event. Up to date information can be found in the Event Guides specified for each event. OBT Northbound to Central Blvd. Turn Left on Central Blvd. Turn Left on Tampa Ave. Lot A entrance is on the Left. OBT Southbound to Central Blvd. Turn Right on Central Blvd. Turn Left on Tampa Ave. Lot A entrance is on the Left. SR-408 Eastbound To John Young Pkwy (SR 423) exit. Turn left on John Young Pkwy. Turn right on Old Winter Garden Road. Turn right on Tampa Ave. Lot A entrance is on the left. SR-408 Westbound To Orange Blossom Trail (17-92) exit. Turn right on Orange Blossom Trail. Turn left on Central Blvd. Turn left on Tampa Ave. Lot A entrance is on the left. I-4 Eastbound To John Young Parkway (SR 423) exit. Proceed Northbound to Old Winter Garden Road. Turn right on Old Winter Garden Road. Turn Right on Tampa Ave. Lot A entrance is on the left. I-4 Westbound To Colonial Drive (SR 50) exit, turn right on Colonial Drive. Turn left on Tampa Ave. Lot A entrance is on the left. OBT Northbound to Central Blvd. Turn Left on Central Blvd. Turn Left on Tampa Ave. Cross over Church Street. Lot E entrance is on the Left. OBT Southbound to Central Blvd. Turn Right on Central Blvd. Turn Left on Tampa Ave. Cross over Church Street. Lot E entrance is on the Left. SR-408 Eastbound To Tampa Ave exit (8B). Turn left onto Tampa Ave. Lot E entrance is on the right. SR-408 Westbound To Orange Blossom Trail (17-92) exit. Keep straight on Long St. Turn right on Tampa Lot E entrance is on the right. I-4 Eastbound To SR408 West. Take Orange Blossom Trail (17-92) exit. Keep straight on Long St. Turn right on Tampa. Lot E entrance is on the right. I-4 Westbound To SR408 West. Take Orange Blossom Trail (17-92) exit. Keep straight on Long St. Turn right on Tampa. Lot E entrance is on the right. OBT Northbound to Long St. Turn Left on Long Street. Travel past S. Rio Grande Ave. Lot G/H entrance will be on your right. OBT Southbound to Long St. Turn Right on Long Street. Travel past S. Rio Grande Ave. Lot G/H entrance will be on your right. SR 408 Eastbound to Orange Blossom Trail Exit. Turn left on Orange Blossom Trail. Turn left on Long St. Continue straight crossing Rio Grande St. Lot G/H entrance is on Right. SR 408 Westbound to Orange Blossom Trail Exit. Continue to travel west on Long St crossing over Rio Grande Ave. Lot G/H entrance is on the right. I-4 Eastbound To Orange Blossom Trail (17-92) exit. Proceed Northbound on Orange Blossom Trail to Long Street. Turn left on Long Street. Lot G/H entrance is on the right. OBT Northbound to Gore Street. Turn Left on Gore Street. Bear Right onto Orange Center Blvd. Turn Right onto S. Tampa Ave. Turn Right on Carter Street. Lot K entrance is on the Left. OBT Southbound to Gore Street. Turn Right on Gore Street. Bear Right onto Orange Center Blvd. Turn Right onto S. Tampa Ave. Turn Right on Carter Street. Lot K entrance is on the Left. SR-408 Eastbound To Tampa Ave exit. Turn right onto Tampa Ave. Turn left on Carter St. Lot K entrance is on the left. SR-408 Westbound To Orange Blossom Trail (17-92) exit. Turn left on Orange Blossom Trail. Turn right on Gore St. Turn right on Tampa Ave. Turn right on Carter Street. Lot K entrance is on the left. I-4 Eastbound To Orange Blossom Trail (17-92 North) exit. Proceed Northbound on Orange Blossom Trail to Gore St. Turn left on Gore St. Turn right on Tampa Ave. Turn right on Carter Street. Lot K entrance is on the left. I-4 Westbound Take SR 408 Westbound exit to Orange Blossom Trail (17-92 South) exit. Turn left onto Orange Blossom Trail (17-92). Turn right on Gore St. Turn right on Tampa Ave. Turn right on Carter St. Lot K entrance is on the left. OBT Northbound to Gore Street. Turn Left on Gore Street. Bear Right onto Orange Center Blvd. Turn Right onto S. Tampa Ave. Turn Right on Carter Street. Lot L entrance is on the Right. OBT Southbound to Gore Street. Turn Right on Gore Street. Bear Right onto Orange Center Blvd. Turn Right onto S. Tampa Ave. Turn Right on Carter Street. Lot L entrance is on the Right. SR-408 Eastbound To Tampa Ave exit. Turn right onto Tampa Ave. Turn left on Carter St. Lot L entrance is on the right. SR-408 Westbound To Orange Blossom Trail (17-92) exit. Turn left on Orange Blossom Trail. Turn right on Gore St. Turn right on Tampa Ave. Turn right on Carter Street. Lot L entrance is on the right. I-4 Eastbound To Orange Blossom Trail exit (17-92). Proceed Northbound on Orange Blossom Trail to Gore St. Turn left on Gore St. Turn right on Tampa Ave. Turn right on Carter Street. Lot L entrance is on the right. I-4 Westbound Take SR 408 Westbound exit to Orange Blossom Trail (17-92 South) exit. Turn left onto Orange Blossom Trail (17-92). Turn right on Gore St. Turn right on Tampa Ave. Turn right on Carter St. Lot L entrance is on the right. OBT Northbound to Gore Street. Turn Left on Gore Street. Bear Right onto Orange Center Blvd. Turn Right onto S. Tampa Ave. Turn Right on Carter Street. Lot M entrance is on the Right. OBT Southbound to Gore Street. Turn Right on Gore Street. Bear Right onto Orange Center Blvd. Turn Right onto S. Tampa Ave. Turn Right on Carter Street. Lot M entrance is on the Right. SR-408 Eastbound To Tampa Ave exit. Turn right onto Tampa Ave. Turn left on Carter St. Lot M entrance is on the right. SR-408 Westbound To Orange Blossom Trail (17-92) exit. Turn left on Orange Blossom Trail (17-92). Turn right on Gore St. Turn right on Tampa Ave. Turn right on Carter Street. Lot M entrance is on the right. I-4 Eastbound To Orange Blossom Trail exit (17-92). Proceed Northbound on Orange Blossom Trail to Gore St. Turn left on Gore St. Turn right on Tampa Ave. Turn right on Carter Street. Lot M entrance is on the right. I-4 Westbound Take SR 408 Westbound exit to Orange Blossom Trail (17-92 South) exit. Turn left onto Orange Blossom Trail (17-92). Turn right on Gore St. Turn right on Tampa Ave. Turn right on Carter St. Lot M entrance is on the right. OBT Northbound to W. Central Blvd. Turn Left onto W. Central Blvd. Lot 1 entrance on left. OBT Southbound to W. Central Blvd. Turn Right onto W. Central Blvd. Lot 1 entrance on left. SR-408 Eastbound To Orange Blossom Trail (17-92) exit. Turn left onto Orange Blossom Trail. Turn left on Central Blvd. Lot 1 Entrance on left. SR-408 Westbound To Orange Blossom Trail (17-92) exit. Turn right on Orange Blossom Trail. Turn left onto Central Blvd. Lot 1 entrance is on the left. I-4 Eastbound To Amelia Exit. Turn left on Amelia. Turn left on Orange Blossom Trail. Turn right on Central Blvd. Lot 1 entrance is on the left. I-4 Westbound To Colonial Drive (SR 50) exit, turn right on Colonial Drive. Turn left onto Orange Blossom Trail (17-92). Turn right onto Central Blvd. Lot 1 entrance is on the left. OBT Northbound to South Street. Turn Left on South Street. Travel past Norton Ave. Lot 5 entrance will be on your right. OBT Southbound to South Street. Turn Right on South Street. Travel past Norton Ave. Lot 5 entrance will be on your right. SR-408 Eastbound To Tampa Ave exit. Turn right on Tampa Ave. Turn left on Carter St. Turn left on Orange Blossom Trail (17-92). Turn left on South St. Lot 5 entrance is on the right. SR-408 Westbound To Orange Blossom Trail (17-92) exit. Turn right on Orange Blossom Trail (17-92). Turn left onto South St. Lot 5 entrance is on the right. I-4 Eastbound To South Street Exit. Turn left on South St. Lot 5 entrance is on the right. I-4 Westbound To Colonial Drive (SR 50) exit, turn right on Colonial Drive. Turn left onto Orange Blossom Trail (17-92). Turn right onto South St. Lot 5 entrance is on the right. OBT Northbound to South Street. Turn Left on South Street. Travel past Norton Ave. Lot 6 entrance will be on your right. OBT Southbound to South Street. Turn Right on South Street. Travel past Norton Ave. Lot 6 entrance will be on your right. SR-408 Eastbound To Orange Blossom Trail (17-92) exit. Turn left onto Orange Blossom Trail (17-92). Turn left on South St. Lot 6 Entrance is on the right. SR-408 Westbound To Orange Blossom Trail (17-92) exit. Turn right on Orange Blossom Trail (17-92). Turn left onto South St. Lot 6 entrance is on the right. I-4 Eastbound To South Street Exit. Turn left on South St. Lot 6 entrance is on the right. I-4 Westbound To Colonial Drive (SR 50) exit, turn right on Colonial Drive. Turn left onto Orange Blossom Trail (17-92). Turn right onto South St. Lot 6 entrance is on the right. OBT Northbound to South Street. Turn Left on South Street. Travel past Norton Ave. Lot 7 entrance will be on your left. OBT Southbound to South Street. Turn Right on South Street. Travel past Norton Ave. Lot 7 entrance will be on your left. SR-408 Eastbound To Orange Blossom Trail (17-92) exit. Turn left onto Orange Blossom Trail (17-92). Turn left on South St. Lot 7 Entrance is on the left. SR-408 Westbound To Orange Blossom Trail (17-92) exit. Turn right on Orange Blossom Trail (17-92). Turn left onto South St. Lot 7 entrance is on the left. I-4 Eastbound To South Street exit. Turn left on South St. Lot 7 entrance is on the left. I-4 Westbound To Colonial Drive (SR 50) exit, turn right on Colonial Drive. Turn left onto Orange Blossom Trail (17-92). Turn right onto South St. Lot 7 entrance is on the left. OBT Northbound to Colyer Street. Turn Left on Colyer Street. Lot 8 will be on street parking in the right lane of Colyer St. Parking attendants will advise on where to park. OBT Southbound to Colyer Street. Turn Right on Colyer Street. Lot 8 will be on street parking in the right lane of Colyer St. Parking attendants will advise on where to park. SR-408 Eastbound To John Young Pkwy (SR 423) exit. Turn left onto John Young Pkwy. Turn right onto Washington St. Turn right onto Orange Blossom Trail (17-92). Turn right on Colyer St. Lot 8 will be on street parking in the right lane of Colyer St. Parking attendants will advise on where to park. SR-408 Westbound To South Street exit. Follow South Street. Turn left on Orange Blossom Trail (17-92). Turn right onto Colyer St. Lot 8 will be on street parking in the right lane of Colyer St. Parking attendants will advise on where to park. I-4 Eastbound To John Young Pkwy (SR 423) exit. Turn left onto John Young Pkwy. Turn right onto Washington St. Turn right onto Orange Blossom Trail (17-92). Turn right on Colyer St. Lot 8 will be on street parking in the right lane of Colyer St. Parking attendants will advise on where to park. I-4 Westbound To Colonial Drive (SR 50) exit. Turn right on Colonial Drive. Turn left onto Orange Blossom Trail (17-92). Turn right onto Colyer St. Lot 8 will be on street parking in the right lane of Colyer St. Parking attendants will advise on where to park. OBT Northbound to Anderson St. Turn Left on Anderson Street. Make a Right on S. Nashville Ave. Lot 9 will be on your left. OBT Southbound to Anderson St. Turn Right on Anderson Street. Make a Right on S. Nashville Ave. Lot 9 will be on your left. SR-408 Eastbound To John Young Pkwy (SR 423) exit. Turn left onto John Young Pkwy. Turn right onto Washington St. Turn right onto Orange Blossom Trail (17-92). Turn right on Colyer St. Turn left on Nashville Ave. Lot 9 entrance is on the right. SR-408 Westbound To John Young Pkwy (SR 423) exit. Turn right onto John Young Pkwy. Turn right on Washington St. Turn right onto Orange Blossom Trail (17-92). Turn right on Colyer St. Turn left on Nashville Ave. Lot 9 entrance is on the right. I-4 Eastbound To Orange Blossom Trail (17-92 North) exit. Proceed Northbound on Orange Blossom Trail to Colyer St. Turn left on Colyer St. Turn left on Nashville Ave. Lot 9 entrance is on the right. I-4 Westbound To Colonial Drive (SR 50) exit. Turn right on Colonial Drive. Turn left onto Orange Blossom Trail (17-92). Turn right on Colyer St. Turn left on Nashville Ave. Lot 9 entrance is on the right. OBT Northbound to Anderson St. Turn Left on Anderson St. Make a Right onto S. Rio Grand Ave. Lot 10 entrance will be on your left. OBT Southbound to Anderson St. Turn Right on Anderson St. Make a Right onto S. Rio Grand Ave. Lot 10 entrance will be on your left. SR-408 Eastbound To Orange Blossom Trail (17-92) exit. Turn left onto Orange Blossom Trail (17-92). Turn left on South St. Turn left on Rio Grande Ave. Lot 10 entrance is on the right. SR-408 Westbound To Orange Blossom Trail (17-92) exit. Turn right on Orange Blossom Trail (17-92). Turn left onto South St. Turn left on Rio Grande Ave. Lot 10 entrance is on the right. I-4 Eastbound To Orange Blossom Trail (17-92 North) exit. Proceed Northbound on Orange Blossom Trail to South St Turn left on South St. Turn left on Rio Grande Ave. Lot 10 entrance is on the right. I-4 Westbound To Colonial Drive (SR 50) exit, turn right on Colonial Drive. Turn left onto Orange Blossom Trail (17-92). Turn right onto South St. Turn left on Rio Grande Ave. Lot 10 entrance is on the right. OBT Northbound to Long St. Turn Left on Long Street. Travel past S. Rio Grande Ave. Lot 11 entrance will be on your right. OBT Southbound to Long St. Turn Right on Long Street. Travel past S. Rio Grande Ave. Lot 11 entrance will be on your right. SR-408 Eastbound To Tampa Ave exit. Turn right on Tampa Ave. Turn left on Carter St. Turn left on Rio Grande Ave. Turn left on Long St. Lot 11 entrance is on the right. SR-408 Westbound To Orange Blossom Trail (17-92) exit. Stay on Long St. Pass Rio Grande Ave. Lot 11 entrance is on the right. I-4 Eastbound To Orange Blossom Trail (17-92 North) exit. Proceed Northbound on Orange Blossom Trail to Long St. Turn left on Long St. Lot 11 entrance is on the right. I-4 Westbound To Colonial Drive (SR 50) exit, turn right on Colonial Drive. Turn left onto Orange Blossom Trail. Turn right onto Long St. Lot 11 entrance is on the right.